As long as you can remember, the Municipal Academy of Fine Arts has been famous for its evening classes on drawing, sculpting, etching, painting art history and art appreciation. You and many of your friends have attended these courses and have become accomplished hobby artists or free-time art aficionados. 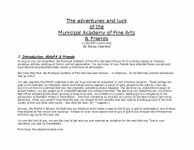 But more than that, the Municipal Academy of Fine Arts has been famous... or infamous... for its field trips and the adventures that go with it. Anyway, the MAoFA is famous. Its field trips are infamous and it takes a special kind of guy or gal to participate in one of those trips despite all the rumors and warnings. It takes an even more special kind of guy or gal to live through one of these trips and then sign up for the next one. You are this kind of guy, you are this kind of gal and you just received an invitation for the next field trip. True to your reputation you sign up immediately.